The aim of the study is to explore the effect of quercetin-loaded solid lipid nanoparticles on trauma therapy and scar inhibition and its related mechanism. Brain external skin of SD rats was removed. Masson staining, Sirius Red staining and scanning electron microscopy was used for the evaluation of the effect of quercetin solid lipid nanoparticle on traumatic repair and scar inhibition. The astrocyte migration model was used to investigate the effect of quercetin. Western blotting was applied to determine the expression of TGF-β1, TGF-βRI, TGF-βRII, Smad2, Smad3, Smad4 and Smad7 in traumatic skin and astrocytes. The repair rate of traumatic skin in groups QL and QS was significantly higher than that in groups C and CS (P<0.05) after 7 days, 14 days and 21 days of administration. Quercetin solid lipid nanoparticles significantly inhibited the proliferation and migration of astrocytes (P<0.05). Compared with C group, the relative expression of TGF-β1, TGF-βRI, TGF-βRII, Smad2, Smad3, Smad4 and Smad7 did not significantly in astrocytes and skin tissue of CS (P>0.05). Compared with groups C and CS, the relative expression of TGF-β1, TGF-βRI, TGF-βRII, Smad2, Smad3 and Smad4 in astrocytes and skin tissue of QL and QS were significantly decreased and the relative expression of Smad7 was significantly increased (P<0.05). Quercetin solid lipid nanoparticles can inhibit the activation of TGF-β/Smad pathway, accelerating the wound repair and inhibiting the formation of scar. Skin trauma, caused by burns, surgery, radiation and other factors, is a common clinical disease, the scar of which was always leading long-term psychological and physiological burden to patients . On the surface it seems that the wound is a local reaction of the organism, but in fact it will lead to series of systemic changes. The report shows that a variety of cells and its secretion of cytokines were involved in the process of development and healing of trauma . Different cells and different cytokines are closely linked, so the cell migration and proliferation is closely associated with wound healing and scar formation. Therefore, the development of drugs to accelerate the wound healing and inhibit the formation of scar has been the focus and difficult questions of the field of skin trauma treatment. At present, drugs, including antibiotics, hormones, cytokines and traditional Chinese medicine in clinical, were applied to treat skin trauma [3-5]. Studies have shown that many cytokines play a key role in various kind of trauma repair . However, since a lot of cytokines with the function were peptide components, which possessed the characteristics of short bioavailability and easy inactivation, and the conventional administration method requires higher dosage. Therefore, the costs of the treatment are high with short-effect. What’s more, the traditional Chinese medicine has multicomponents, multi-targets, low side effects, and low drug resistance. When traditional Chinese medicine was used for treatment of skin trauma, an appropriate drug carrier plays a key role . Solid lipid nanoparticles (SLN) is a lipid drug delivery system developed recently, which was consisted of solid, natural or synthetic, physiologically compatible material, and SLN is solid at 25°C with high stability and low toxicity, which has great prospects for development. Quercetin is a flavonoid possessing anti-oxidant, anti-inflammatory, anti-proliferative and anti-atherosclerotic effects, which can be widely found in vegetables, fruits and other daily diets [8,9]. Precious studies have revealed that quercetin can regulate the expression of genes in astrocyte cell to protect neurons and retard the progress of neurodegenerative diseases  and some studies show that quercetin possess the activity of wound healing and scar suppression . But the action mechanism has not been fully elucidated. Therefore, this study established the rat model of complete skin resection and astrocyte migration model, to explore the quercetin solid lipid nanoparticles on the scratches healing and scar formation and its mechanism. Quercetin (purity 99%, China Pharmaceutical and Biological Products Institute, Beijing, China); SNL was prepared by ourselves; glycerol tristearate (Shanghai test carved Limited, Shanghai, China); Poloxamer 188 (BASF company, Germany); carbomer 934 (Shanghai test firm Co., Ltd., Shanghai, China), Hematoxylin (Sigma company, Germany); FeCl3 (Sinopharm Group, Beijing, China); Phosphotungstic acid and phosphomolybdic acid (Aladdin Reagent Company); TGF-β1, TGF-βRI, TGF-βRII, Smad2, Smad4, Smad7, Smad7 (Santa Cruz Biotechnology company, Shanghai, China); HRP labeled goat anti-mouse lgGl (Jackson company, Shanghai, China); cytoselectTM 24-wellrap healing assay (cell biolabs, Chlorpromazine (Shanghai Hefeng Co., Ltd.); methyl β- cyclodextrin (Shanghai Dingjie Biotechnology Company, Shanghai, China); Ami Loli (Sigma, Germany); RPMI-1640 medium and EDTA-containing trypsin (Grand Island Biological Company, New York, USA); fetal bovine serum (Hydone); penicillin-streptomycin (Wuhan Boster, Wuhan, China). Clean bench and carbon dioxide cell incubator (Shanghai Bo Xun Industrial Co., Ltd. medical equipment factory, Shanghai, China); Paraffin embedding machine and dissecting mirror (Jiangnan Instrument Company, Jiangsu, China); Tension machine (Shandong Blu-ray); Stone Leaping Machine (Leica Company); Flow cytometry (Beckman). 48 SPF grade SD female rats with 8 weeks old were purchased from Nanjing Qingnong Mountain Experimental Animal Center (Nanjing, Jiangsu, China). They were housed in cages with a constant humidity (ca. 60% ± 2%) and temperature (ca. 25 ± 1°C) and with a light/dark cycle of 12 h. During the experiment, they were free access to water and food. After weighing 220~240 g, the 48 rats were randomly divided into four groups: quercetin solution group (QL, 5 mg/(kg•d)), quercetin solid lipid nanoparticles group (QS, 5 mg/(kg•d)), blank control group(C) and blank solid lipid nanoparticles group and (CS), and each group contain 12 SD rats. After anesthesia by ether, the hair of all rats was cut off for the area of 2 cm × 2 cm in brain epidermis. Then, the wound was sterilized with iodine, and 30 min later, rats in each group began to administer percutaneously. C group and CS group were given for the same volume of saline by percutaneous administration. During the study, the phenomenon about wound healing and scar formation was observed. Wound closure rate at the Nth day(%)=(Trauma area at the first day- Trauma area at the Nth day)/Trauma area at the first day*100. At the end of treatment, full skin in wound was removed and subcutaneous fat was peeled off. The skin of 6 rats in each group was fixed in 20 volumes of 4% formaldehyde, which was used for Fontana-Masson staining  and Sirius Red Straining . And the skin of other 6 rats were preserved in liquid nitrogen and then transferred to -80°C. Taking β-actin as the internal reference, western blotting technique was applied to detect the relative expression of TGF-β1, TGF-βRI, TGF- βRII, Smad2, Smad3, Smad4, Smad7 in the skin tissues of each group. Cell culture: Twelve SD rats were anesthesia by inhalation of ether, 75% ethanol was used to disinfect, after removing the brainstem and cerebellum and being washed by D-Hank solution, the brain was peeled off from meninges and blood vessels and was cutted into a paste. Then, it was digested in 0.25% trypsin at 37°C for 10 min, and the digestion was terminated by complete medium (10% DMEM/F, 12% FCS, 1.2 g/L NaHCO3, 100 U/ml penicillin, 100 U/ml streptomycin, 15 mmol/L HEPES). The solution was centrifuged at 13000 rpm for 10 min at 4°C and the precipitation was resuspended. After being cultured for 20 min in incubator containing 5% CO2 and maintaining the temperature at 37°C and with saturation humidity, the culture flask was flipped and the cell suspension was aspirated and the fibroblasts were removed. The cell with the concentration at 106/mL were then seeded in a polylysine-coated petri dish. And the culture medium was replaced every two days. After being cultured for 4 weeks, glial fibrillary acidic protein (GFAP) immunocytochemical staining was applied. The cell was handled with formalin fixation and peroxidase for 10 min, and anti-GFAP was added for 12 h at 4°C. At last, secondary antibody was added and maintained for 10 min at 25°C. DAB was applied to color and under the microscopic observation, the cells were brown, revealing the cultured cells were astrocytes. MTT test: Astrocyte cell was digested in 0.25% EDTA and diluted to a cell density of 105 cells/mL. 0.1 mL cells were added to each well in a 96-well plate. 24 h later, the culture solution was replaced by 0.1 mL medium containing drug. The cells were divided into four groups: control group; different doses of quercetin solution group (5 μmol/L, 10 μmol/L, 25 μmol/L, 50 μmol/L and 100 μmol/L); different doses of quercetin solid lipid nanoparticles group (5 μmol/L, 10 μmol/L, 25 μmol/L, 50 μmol/L and 100 μmol/L). After being cultured for 48 h, culture medium was replaced by 20 μL MTT solution (5 mg/mL). After incubation for 4 h, the culture medium was replaced by 150 μL DMSO. After standing for l0 min, the OD values of each well were measured at 570 nm by a microplate reader. Establishment of migration model of astrocytes: 9 horizontal and 9 vertical vertically crossed on a 35 mm petri dish lid, on which a glial cell culture dish was placed. 10 μL tip was applied to draw the trace along the 9 horizontal and 9 vertical. The experiment was divided into four groups. The first group was the control group (group C), which was added into DMEM with 10% FBS after being scratched. The second group was solid lipid nanoparticles group (group CS), which was added into DMEM with 10% FBS and solid lipid nanoparticles after scratches. The third group was quercetin solution group (group QL, 50 μmol/L), which was added into DMEM with 10% FBS and quercetin solution after scratches. The fourth group was quercetin solid lipid nano gel group (QS group, 50 μmol/L), which was added into DMEM with 10%FBS and quercetinloaded solid lipid nanoparticles after scratches. Four groups of cells were cultured in a 5% CO2 incubator, and three plates were repeated in each group. The migration of cells in the four groups was observed at 0 h, 6 h, 12 h, 24 h, 36 h and 48 h after treatment, and migration index (Ix) was calculated. Ix=3LX/(Lc+LCS+LQS +LQL). Lc, LCS, LQS, LQL stand for the average width of all scratches of C, CS, QS and QL at different time, respectively. The larger the value of Ix is, the slower the cell migration rate is. All experimental procedures were carried out in accordance with the Guide for the Care and Use of Laboratory Animals. And before the animal experiments were carried out, the procedures were approved by the Research Ethical Committee of Suzhou University (No. 1607260004, Suzhou, China). Western blotting determined the expression of related proteins in cells: Total protein extract from astrocyte cells in group C, CS, QL and QS was resolved on 8% SDS-polyacrylamide gels and transferred to polyvinylidene fluoride (PVDF) membranes by a semi-dry transfer blotting system, respectively. After blocking for 2 h at 4°C in blocking buffer (10% fat-free milk TBS with 0.1% Tween 20), the membranes were incubated overnight with primary antibodies, including TGF-β1, TGF-βRI, TGF-βRII, Smad2, Smad3, Smad4, Smad7 and β-actin. After horseradish peroxidase-labeled secondary antibodies were added at 37°C for 1 h, the blots were visualized with the ECL-plus detection system. Analysis of gray was performed using Quantity One Software. SPSS 17.0 software (SPSS Inc., Chicago, IL, USA) was applied for statistical analysis. Statistical results were expressed as mean ± standard deviation (SD). Comparisons between groups were made using one-way ANOVA followed by Tukey multiple comparison test. A p-value<0.05 was regarded as statistically significant. 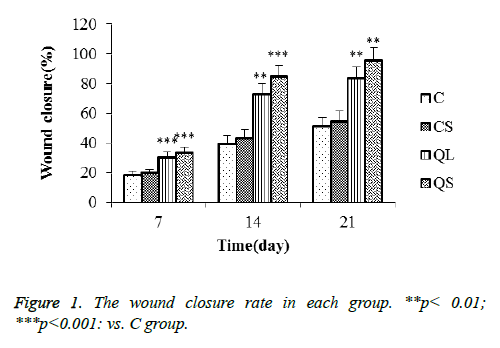 The repair rate of traumatic skin in each group rats was shown in Figure 1 after 7 days, 14 days and 21 days. The repair rate of skin trauma in each group increased gradually with the prolongation of treatment time. The repair rate of skin trauma in C and CS group was longer than that of QL and QS group, indicating that the wounded skin has a certain self-repair ability, but the use of quercetin can shorten the cure time. In addition, the repair rate of QS group was higher than that of QL group. Figure 1: The wound closure rate in each group. **p< 0.01; ***p<0.001: vs. C group. At the end of the experiment, the skin tissue of the wound was collected for Masson staining. In group C, no angiogenesis was observed and collagen has a high density. In the CS group, most skin tissues were not repaired, and part collagen of skin tissues were was neatly arranged, which contained very few angiogenesis. In the QL and QS groups, the repair of skin tissue was basically intact, and the tissue morphology is similar to that of the health rat. What’s more, collagen was neatly arranged and angiogenesis is very obvious in the two group. The repair outcome in QS group is more obvious. The result showed that quercetin solution and its solid lipid nanoparticles could promote wound repair and inhibit scar formation, and the effect of quercetin solid lipid nanoparticle gel was more significant than quercetin solution. The skin tissue was stained with picric acid Sirius red and was observed under polarized light microscopy. Collagens possess the properties of positive uniaxial birefringence. Collagen fiber has the properties of positive uniaxial birefringence. When using a 500 nm filter, type I collagen fibers show red. Type III collagen fibers were yellow-green when observed with a 700 nm filter. In the early stage of trauma repair, type III collagen fibers were the main collagen fibers. In the later stage of trauma repair, type I collagen fibers were the main collagen fibers, and the ratio of type I collagen fibers and type III collagen fibers can be used to access traumatic repair. In skin of health rat, most collagen is type I collagen fibers showing red, and a small part of collagen were type III collagen fibers, showing yellow-green and the collagen was neatly arranged. In C and CS groups, most collagen is type III collagen fibers. In the QL group, the ratio of type I collagen fibers to type III collagen fibers was about one. In the QS group, most collagen is type I collagen fibers with a small part of type III collagen fibers. The results show that quercetin can treat trauma, and its solid lipid nanoparticle gel treatment effect is most significant. It was reported that it is difficult to form a scar if the collagen in wound skin is neatly arranged . This study showed the collagen arrangement of rat skin in C and CS group is very disorderly. However, the collagen arrangement of rat skin in QL and QS group was orderly rows. The result reveal quercetin can inhibit scar formation. The expression of the related proteins in the skin tissues was shown in Figure 2 after 21 days of administration. Compared with group C, there was no significant difference in the relative expression of TGF-β1, TGF-βRI, TGF-βRII, Smad2, Smad3, Smad4 and Smad7 in CS group (P>0.05). In the QL and QS groups, the expression of TGF-β1, TGF-βRI, TGF-βRII, Smad2, Smad3 and Smad4 were significantly decreased and the relative expression of Smad7 was significantly increased (P<0.05). 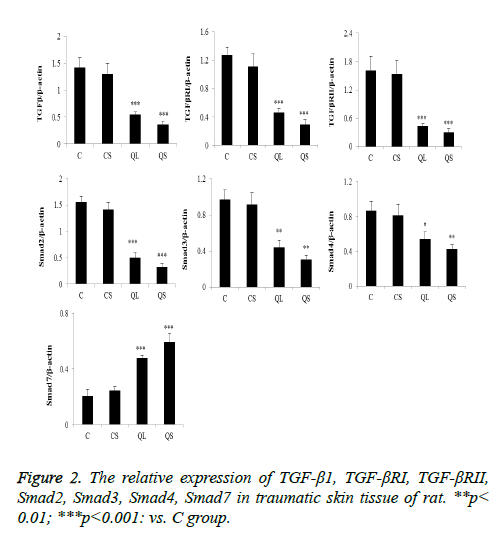 Figure 2: The relative expression of TGF-β1, TGF-βRI, TGF-βRII, Smad2, Smad3, Smad4, Smad7 in traumatic skin tissue of rat. **p< 0.01; ***p<0.001: vs. C group. As shown in Figure 3, quercetin solution and quercetin solid lipid nanoparticles can inhibit the proliferation of astrocytes. When the concentration of quercetin is 5~50 μmol/L, the inhibitory effect increases with increasing concentration. When the concentration reached 50 μmol/L, the effect of inhibiting cell proliferation does not enhance with increasing concentration. At the same concentration, the function of quercetin solid lipid nanoparticles is slightly stronger than that of quercetin solution. 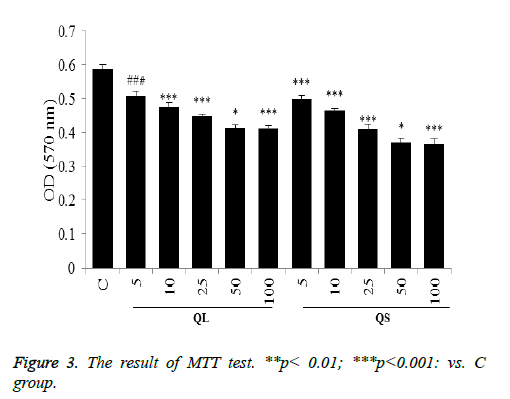 Figure 3: The result of MTT test. **p< 0.01; ***p<0.001: vs. C group. As shown in Figure 4, quercetin solution and quercetin solid lipid nanoparticles could significantly inhibit the migration of astrocytes after culturing for different time. Figure 4: Analysis of quercetin inhibiting migration of astrocyte cell. **p<0.01; ***p<0.001: vs. C group. The determination of the related proteins in astrocytes of each group was shown in Figure 5. Compared with group C, there was no significant difference in the relative expression of TGF- β1, TGF-βRI, TGF-βRII, Smad2, Smad3, Smad4 and Smad7 in CS group (P>0.05). In the QL and QS groups, the expression of TGF-β1, TGF-βRI, TGF-βRII, Smad2, Smad3 and Smad4 were significantly decreased in astrocytes and the relative expression of Smad7 was significantly increased (P<0.05). These results were consistent with that of skin tissues. 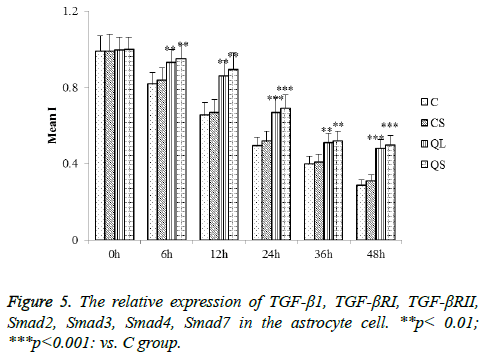 Figure 5: The relative expression of TGF-β1, TGF-βRI, TGF-βRII, Smad2, Smad3, Smad4, Smad7 in the astrocyte cell. **p< 0.01; ***p<0.001: vs. C group. The formation of skin scars is closely associated with the role of glial cells, immune cells and neurons. Astrocytes are mostly present in the brain of mammals, accounting for the largest proportion of glial cells, which play a key role in the occurrence and development of various infections such as bacterial infection, inflammation and trauma [15,16]. Studies have shown that activation of astrocytes can inhibit inflammation and accelerate the formation of glial scars [16,17]. Therefore, astrocytes possess the important effect on the formation of skin scars. Studies reported that TGF-β1/smad3 signaling pathway is involved in the formation of glial scars . TGF-β1 is a subtype of TGF-β family, and there are two subtypes of TGF- β2 and TGF-β3 in mammals, which mainly play a biological effect through specific receptors I, II, III. TGF-βRI and TGF- βRII work in the signal transduction of TGF-β1/smad3 signaling pathway the main receptor. When the TGF-βRII kinase is activated, the downstream Smad protein substrate can be phosphorylated, leading the TGF-β signal into the cell . Smad2, 3, 4 is a protein that binds to microtubules. When subjected to TGF-β stimulation or microtubule destruction, Smads transcription activity will increase and further stimulate the TGF-β receptor. Smad7 is an antagonist of TGF-βRI in cells, which avoids smad3 binding to TGF-β receptor and blocks TGF-β/smad signal transduction . Quercetin is a common flavonoid compound. Pharmacological activity studies have shown that quercetin has antioxidant, anti-virus, anti-bacterial, anti-inflammatory response, anti-cancer [8,9,21,22] and plays an important role in the prevention of tumorigenesis, cardiovascular system and neurodegenerative diseases . It has been reported that quercetin has a certain repair effect on various trauma and has a certain inhibitory effect on skin scars . The results of the study showed that scar formation speed in quercetin-loaded solid lipid nanoparticle-treated rats was lower than that in quercetin solution-treated rats, but the outcome of wound healing was better, the reason of which may be that the solid lipid nanoparticles favored the slow release of quercetin and that the carbomer gel with good biocompatibility have a wetting effect, playing a role in protecting the wound and thereby promoting wound repair. What’s more, this study found that quercetin significantly inhibited the proliferation of astrocytes in scratches, possibly because quercetin could block proliferative astrocytes in the period of Gi . In, conclusion, the results of this study showed that quercetin solid lipid nanoparticles can inhibit the activation of TGF-β/Smad pathway, accelerating the wound repair and inhibiting the formation of scar. The present study was supported by Zhangjiagang City Scientific Research Project (ZKY201614). Niţescu C, Calotă DR, Stăncioiu TA, Marinescu SA, Florescu IP, Lascăr I. Psychological impact of burn scars on quality of life in patients with extensive burns who received allotransplant. Rom J Morphol Embryol 2012; 53: 577-83. Profyris C, Tziotzios C, Vale ID. Cutaneous scarring: Pathophysiology, molecular mechanisms, and scar reduction therapeutics: Part I. The molecular basis of scar formation. Am J Acad Dermatol 2012; 66: 1-10. Marquez L, Palazzi DL. Antibiotic treatment for febrile urinary tract infection: The clock is ticking. JAMA Pediatrics 2016. Zhao R, Yan Q, Huang H, Lv J, Ma W. Transdermal siRNA-TGFβ1-337 patch for hypertrophic scar treatment. Matrix Biol 2013; 32: 265-276. Chen F, Ying D, Yan X, Yonghua SU, Zhang X, David L, Zee U. Shikonin reduces TGF-β1-induced collagen production and contraction in hypertrophic scar-derived human skin fibroblasts. Int J Mol Med 2015; 36: 985-991. Jagdeo J, Shumaker PR. Traumatic Scarring. JAMA Dermatology 2017; 153: 364. Saupe A, Gordon KC, Rades T. Structural investigations on nanoemulsions, solid lipid nanoparticles and nanostructured lipid carriers by cryo-field emission scanning electron microscopy and Raman spectroscopy. Int J Pharm 2006; 314: 56-62. Boots AW, Haenen GR, Bast A. Health effects of quercetin: from antioxidant to nutraceutical. Euro J Pharmacol 2008; 585: 325. Kleemann R, Verschuren L, Morrison M, Zadelaar S, van Erk MJ, Wielinga PY, Kooistra T. Anti-inflammatory, anti-proliferative and anti-atherosclerotic effects of quercetin in human in vitro and in vivo models. Atherosclerosis 2011; 218: 44. Petit JM, Gyger J, Burlet-Godinot S, Fiumelli H, Martin JL, Magistretti PJ. Genes involved in the astrocyte-neuron lactate shuttle (ANLS) are specifically regulated in cortical astrocytes following sleep deprivation in mice. Sleep 2013; 36: 1445. Karamichos D, Kivanany P, McKay TB, Petroll M. Quercetin inhibits corneal scar formation in vivo. Invest Ophthalmol Visual Sci 2016. Yamaguchi Y, Kiyohara T, Iino S, Yoshida M. A case of acral nevus on the left sole diagnosed by Fontana-Masson staining. Skin Cancer 2014; 28: 279-282. Junqueira LC, Cossermelli W, Brentani R. Differential staining of collagens type I, II and III by Sirius Red and polarization microscopy. Nihon Soshikigaku Kiroku 1978; 41: 267. Mansfield JC, Winlove CP, Moger J, Matcher SJ. Collagen fiber arrangement in normal and diseased cartilage studied by polarization sensitive nonlinear microscopy. J Biomed Optics 2008; 13: 044020. Chauhan V, Sterka D, Furr S, Young A, Marriott I. NOD2 plays an important role in the inflammatory responses of microglia and astrocytes to bacterial cns pathogens. Glia 2009; 57: 414-423. Karve IP, Taylor JM, Crack PJ. The contribution of astrocytes and microglia to traumatic brain injury. Br J Pharmacol 2016; 173: 692-702. Kwan T, Floyd CL, Kim S, King PH. RNA binding protein human antigen r is translocated in astrocytes following spinal cord injury and promotes the inflammatory response. J Neurotrauma 2017; 34: 1249. Zhang YF, Zhou SZ, Cheng XY, Yi B, Shan SZ, Wang J, Li QF. Baicalein attenuates hypertrophic scar formation via inhibiting TGF-β/Smad2/3 signaling pathway. Br J Dermatol 2015; 174: 120-130. Ottesen JJ, Huse M, And MDS, Muir TW. Semisynthesis of phosphovariants of smad2 reveals a substrate preference of the activated TβRI Kinase. Biochemistry 2004; 43: 5698-706. Meng XM, Huang XR, Xiao J, Arthur C K C, Qin W, Chen HY, Lan HY. Disruption of Smad4 impairs TGF-β/Smad3 and Smad7 transcriptional regulation during renal inflammation and fibrosis in vivo and in vitro. Kidney Int 2012; 81: 266-279. Chen C, Jiang ZY, Yu B, Wu XL, Dai CQ, Zhao CL, Ju DH, Chen XY. Study on the anti-H1N1 virus effects of quercetin and oseltamivir and their mechanism related to TLR7 pathway. J Asian Nat Products Res 2012; 14: 877-885. Pandey SK, Patel DK, Thakur R, Mishra DP, Maiti P, Haldar C. Anti-cancer evaluation of quercetin embedded PLA nanoparticles synthesized by emulsified nanoprecipitation. Int J Biol Macromol 2015; 75: 521. Shytle RD, Smith AJ, Kavuru P, Wojtas L, Zaworotko MJ. Cocrystals of quercetin with improved oral bioavailability may be useful for treating neurodegenerative disease. Cell Transplant 2012: 791-792. Yuan Z, Yao F, Hu Z, Sun S, Wu B. Quercetin inhibits the migration and proliferation of astrocytes in wound healing. Neuroreport 2015; 26: 387.